Kingspan Kooltherm pipe insulation is the thinnest and most efficient product available for the insulation of pipework in building services / HVAC applications and is suitable for both new build and refurbishment projects in the residential, commercial, institutional, industrial and leisure sectors. It offers many advantages to the specifying engineer, the M&E contractor, the installer, the building services manager and the facilities manager as well the property developer and the building owner who all seek a highly effective and long term energy saving solution. Kooltherm Pipe Insulation conforms to all relevant Regulations and Codes, is non-fibrous, CFC/HCFC-free, with zero Ozone Depletion Potential (ODP) and low Global Warming Potential (GWP). 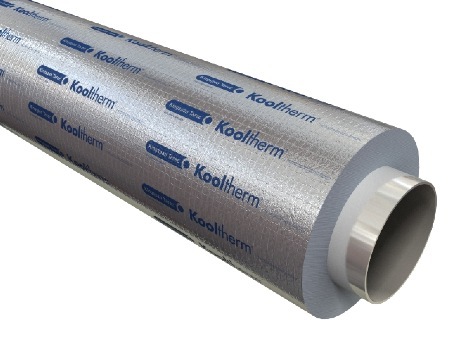 Kooltherm Pipe Insulation System is specifically designed for insulating pipework and equipment operating within the temperature range -50°C to +120°C, making it ideal for warm, hot and heating services and for cold, chilled and refrigeration services. Kooltherm Pipe Insulation has the lowest thermal conductivity of any commonly used insulant – as low as 0.025 W/m.K(the "aged" value, not the initial value which is more commonly quoted at 0.021 W/m.K) (at 10°C mean declared in accordance with EN14314). As a result, Kooltherm Pipe Insulation is the most thermally efficient and the thinnest possible insulation product routinely used on pipework in building services and/or HVAC applications for achieving the required thermal performance. 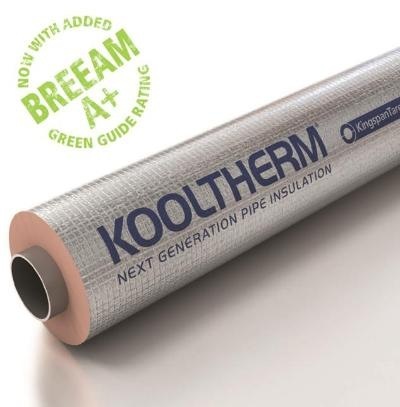 Kooltherm Pipe Insulation features patented phenolic foam technology with 95% (or greater) closed cell structure that effectively eliminates the risk of moisture. Conventional open cell products have little resistance to moisture penetration and a 1% ingress by volume can increase thermal conductivity by up to 107%. Such increases in the thermal conductivity of the material could have a very significant impact on the level of heat loss and/or gain on a building services installation. The factory applied aluminium foil facing provides a high performance vapour barrier jacket. As indicated right, lower thermal conductivity values can be achieved with thinner Kooltherm insulation. The thermal conductivity of Kooltherm can be up to 40% better than mineral fibre and flexible elastomeric foam. The excellent fire and smoke performance of Kooltherm Pipe Insulation and Insulated Pipe Support Inserts provides a high resistance to burning and spread of flame with almost complete absence of smoke. Kooltherm does not melt or drip and is tested to Euroclass B-s1, d0. Kooltherm Pipe Insulation is FM Approved per Approval Standard 4924. This site is operated by Advanced Insulation, an Online Pipe Insulation Distributor. We supply a range of insulation materials, including Kooltherm phenolic pipe insulation manufactured by Kingspan Tarec.